Meaning: The red stripe represents the country's progress and struggle to achieve a better quality of life. The white stands for freedom and justice and green symbolizes the fertility and natural resources of the land, as well as hope. 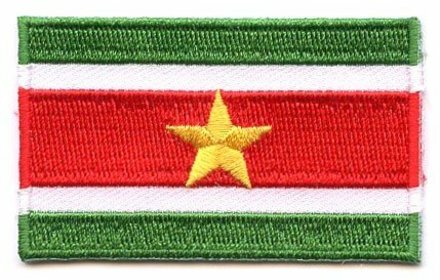 Originally, the colors also represented three of Suriname's political parties. Red was for the Hindu Vatan Hitkari, white represented the People's Party and green stood for the National Party. The star represents a golden future for Suriname, achieved through unity and hard work. The individual points represent the country's five main ethnic groups of the nation which are Creoles (mixed African and Native American descent), Asian Indians, Chinese, American Indians and Europeans. History: The Suriname flag was adopted on November 25, 1975, when Suriname gained its independence from the Netherlands. The country was formerly known as Dutch Guiana. 1667, the British gave up their part of Suriname to the Dutch for the North American Dutch colony of New Amsterdam which is now New York. Interesting Facts: The Suriname flag was chosen after a nationally held flag design competition. The purpose of the event was to create a flag which symbolized Suriname's unity and progress, as well as incorporated the colors of Suriname's main political parties. The flag's designer was Jacques Herman Pinas (source: worldflags101).